Yes, by flying much farther you can pay a lot less. 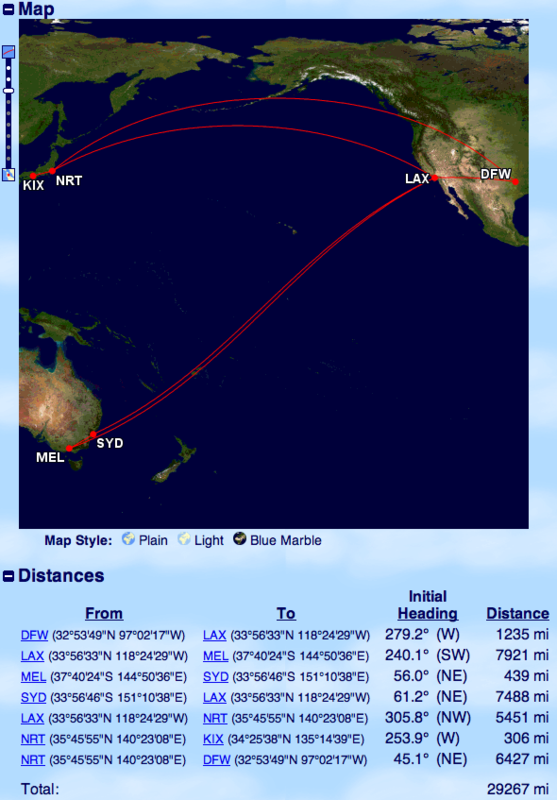 Much to my surprise, flying from Australia to Japan is much cheaper if you go via Los Angeles instead of flying a more direct route. Yes, by taking more flights, burning more fuel, taking up more airline personnel time, and eating more great airline food, i.e. costing the airline more money, they will charge you less. That sums up the problems with airline industry – they are too clever for themselves. The airlines use complex pricing models to try to fill all the seats on their planes. They place various restrictions to try to segment their buyers by the price they are willing to pay and the restrictions they are willing to put up with it. Required Saturday night stays seem to be a thing of the past, but are now replaced by strange routings to get reduced fare tickets. The above routing is an extreme example. And yes, I did fly this routing. Flying an extra 9,000 miles compared to a more direct routing is not fun, but saving $4,000 is. Several airline gate agents quizzed me about the strange routing and wondered if it was some elaborate scheme to collect airline miles. Nope, just trying to take advantage of the airlines’ wacky pricing models to save some money. This pricing model is a “look at the trees and ignore the forest” strategy. Don’t be so clever airline guys. Follow the lead of Southwest Airlines in using a simplified pricing model. Sure, it is not as clever as your complex pricing models, but who makes more money, Southwest or your airline? This entry was posted in Customer Service, Flying, Travel, Uncategorized and tagged airlines, American Airlines, pricing, travel. Bookmark the permalink.